President Donald Trump on Saturday offered sharper criticism of Saudi Arabia's explanation of the death of journalist Jamal Khashoggi, saying "obviously there's been deception, and there's been lies. "In an interview with the Washington Post late Saturday, Trump continued to defend the nation as an "incredible ally" and allowed for the possibility that Khashoggi's death was not directly ordered by Saudi Crown Prince Mohammed bin Salman. "Nobody has told me he's responsible. Nobody has told me he's not responsible. We haven't reached that point," he said, adding, "I would love if he wasn't responsible. "The remarks were harsher than Trump's previous comments following the explanation. "It's early — we haven't finished our review or investigation — but it's, I think, a very important first step, and it happened sooner than people thought it would happen," the president said Friday.Trump ally Lindsey Graham said on Fox News that he did not think the Saudi's explanation was "credible at all. ""It's ridiculous to believe 18 people would go to Turkey to kill Mr. Khashoggi and nobody in the government know about it," he said.Saudi Arabia's explanation Friday that the Saudi journalist's death at its Istanbul consulate was a result of a "quarrel and fighting by hand" drew international criticism and doubts about the crown prince's involvement. Saudi Arabia also said that 18 of its citizens were arrested as the result of its government's investigation into what happened to Khashoggi after he disappeared on Oct. 2 after visiting the consulate.It was the first time the nation acknowledged that Khashoggi died in the consulate after a series of denials and shifting explanations in the 17 days since he disappeared. Below is a timeline of Saudi Arabia's responses to Khashoggi's disappearance. Oct. 2: Jamal Khashoggi goes missing after entering the Saudi consulate in Istanbul just after 1 p.m. to obtain documents to marry his Turkish fiancée, Hatice Cengiz. Oct. 3: Saudi Crown Prince Mohammed bin Salman tells Bloomberg his understanding is that Khashoggi left the consulate after "a few minutes or one hour" and that Saudi Arabia was investigating through its foreign ministry "to see exactly what happened at that time." Oct. 4: Saudi Arabia releases a statement via its consul general in Istanbul confirming it was "following up on the media reports" of the disappearance and saying it was working with Turkish authorities to "uncover the circumstances of the disappearance of Jamal Khashoggi after he left the consulate building." Oct. 6: Saudi Arabia released a statement from the consul general in Istanbul, saying: "I would like to confirm that Jamal is not at the consulate nor in the Kingdom of Saudi Arabia, and the consulate and the embassy are working to search for him." That same day, the Saudi Embassy in Washington released a statement that "dismissed the report by the media, which cited Turkish officials, that Saudi citizen Jamal Khashoggi was killed in the Consulate in Istanbul." 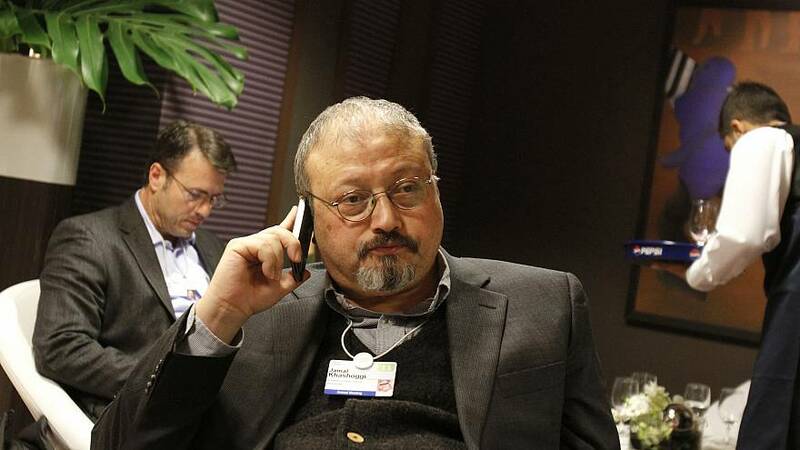 Oct. 7: A Saudi official issued another statement dismissing reports by Reuters that Khashoggi was killed at the consulate. "The official strongly denounced these baseless allegations, and expressed his doubt that they came from Turkish officials that are informed of the investigation or are authorized to comment on the issue," the statement said. Oct. 8: An Axios reporter receives an unsolicited WhatsApp message from the Saudi ambassador to the United States, Prince Khalid bin Salman, saying reports that Khashoggi went missing in the consulate or that Saudi authorities have detained or killed him were "absolutely false and baseless." Oct. 11: Turkey said it had agreed with Saudi Arabia to make a joint group to investigate the disappearance. Oct. 12: Saudi Arabia's Minister of the Interior, Prince Abdulaziz bin Saud bin Naif bin Abdulaziz, released a statement denouncing "false accusations circulated in some media" regarding the disappearance, adding that reports that the nation ordered Khashoggi killed "are lies and baseless allegations." Oct. 13: The Saudis issue a statement condemning the "false accusations circulated in media reports on the Saudi government and other people in the purported relation to the disappearance of Saudi citizen, Jamal Khashoggi." Oct. 15: Trump said on Twitter that he spoke with the king of Saudi Arabia and that the king denied knowledge of what happened to Khashoggi. Moments after that tweet, Trump told reporters that based on his conversation with King Salman, "it sounded to me like maybe these could've been rogue killers." 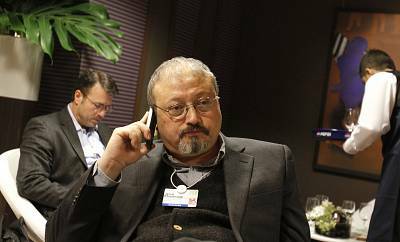 Oct. 16: Saudi Arabia's government was discussing a plan to admit that Khashoggi was killed after entering the consulate, three people with knowledge of the situation told NBC News. Oct. 19: Saudi Arabia acknowledges for the first time Khashoggi died at the consulate and announces that 18 Saudi citizens have been arrested.